Details of the European Union’s Horizon 2020 programme were published earlier this month. Horizon 2020 describes the research and development areas into which the EU will be pouring €80 billion of money between 2014 and 2020. 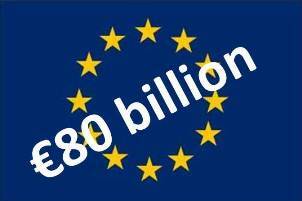 €80 billion is a lot of money so it’s important that it is spent as effectively as possible. The EU sees R&D as one of the key ways to help lift Europe out of its economic doldrums. Horizon 2020 places emphasis on transport in urban areas. According to the report, passenger kilometres travelled are expected to double over the next 40 years, and grow twice as fast as the passenger kilometres for air travel. CO2 emissions could grow to 35% by 2050. Congestion charging is predicted to increase by about 50%, and raise €200 billion a year across the whole of Europe. The report also raises the issue of safety – 34,000 people die each year on European roads (around 43,000 per year die in the USA). Research funded by Horizon 2020 will aim to change these numbers: reduce the number of road fatalities, cut CO2 and reduce traffic. The tagline is “greener, smarter and more integrated”. Who can argue with that? More details on Horizon 2020 and the transport element of the research programme can be found here. Previous articleBiofuels – do they cost the Earth?